First published in 1969, this volume presents a survey of the contemporary national education system in Latin American countries. Laurence Gale describes the uneven provision of schools for different sections of the community and the problems which arise with the racial, cultural and geographical difficulties. He examines the main features in education throughout Latin America, areas of co-operation and agreement and differences of policy and provision. 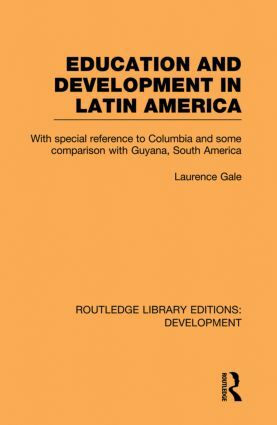 Routledge Library Editions: Development will re-issue works which address economic, political and social aspects of development. Published over more than four decades these books trace the emergence of development as one of the most important contemporary issues and one of the key areas of study for modern social science.